In response to clients' feedback, the Moderno was designed in 2004 and remains a popular choice with our clients. 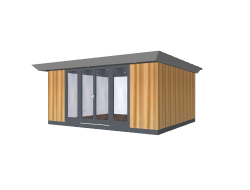 The metal-clad, angled roof fascia distinguishes the Moderno from the rest of the garden room pack. 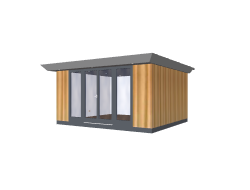 The considerable roof overhang has a dual function, providing shelter for the double door entrance and a sunscreen for the glazing, preventing glare and overheating in the summer. 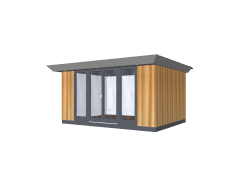 This is a design that makes a stylish impact whether set in capacious grounds or in the more modest proportions of a terrace back garden. The Moderno is a good choice for everyone who prefers simplicity and modern style. An elegant, modern structure, it achieves the delicate balance between form and function. Rooms Outdoor Limited, 14 Market Road, London, N7 9PW. Freephone: 0800 6122 540 Landline: 020 7607 0088 Email: info@roomsoutdoor.co.uk. Copyright © 1998 – 2019.